Established in 1994, The Vein and Laser Clinic is proud to celebrate twenty years of clinical excellence. Visit our new location in Tyson's Corner, Va - there is no obligation when you schedule a consultation, schedule online or call (703) 448-8818. Get the treatment and experience you deserve at The Vein and Laser Clinic. A valid phone number is required to schedule an appointment. This is for confirmation purposes. Don't worry, your information will never be shared with third parties. You will recive a confirmation for your selected date and time. Selected dates and times are not guranteed and you may be asked to reschdule based on availabiliy. Meet with an experienced medical professional to help you determine the best plan to meet your health and beauty goals . A free consultation provides the opportunity for you to receive a customized personal plan, learn the specific costs involved, and understand the procedures. We specialize in helping Virginia, Maryland, and Washington D.C. residents look as young as they feel! 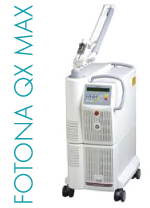 Featuring the Fotona® QX MAX™ and the Lumines® LightSheer® Duet™ , we carry the latest in modern medical laser technology. Visit us at our brand new location in Tyson's Corner.